We provide our clients with an exclusive range of High Performance Non Woven Geo Textile Fabrics. These have chemical resistant and UV finish and can withstand the effects due to biological & environment changes. Owing to these features, our range of Geo Textile find applications in Filtration, Reinforcement, Drainage and Separation. Color White , Black, etc. We can offer Nonwoven Geotextile used for waterproofing purposes. Nonwoven Geotextile for waterproofing ourposes are offered from 80 GSM to 1000 GSM as per customer's requirement. These Fabrics are Calendered as per requirement resulting in better bonding with the water proofing surface. These geotextiles are made using synthetic fibers with base material being Polypropelene or Polyester , as per customer's requirement. Width can be offered from 1 mtr to 6 mtr. Standard Widths in Mtrs are 1/2/2.5/3/5.8 and Standard Roll Length is 100 mtr. Colours offered regulalrly are Black and White. Packaging Details: Roll Length and Roll Width can be customised. RP Make Geo Fabric are used for Drainage purposes as well. 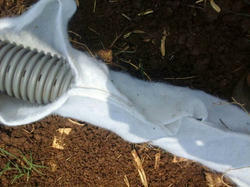 They are stitched into sleeves and are put on the perforated pipes for drainage purposes as shown in the photo. These Sleeves are stitched using high strength yarn with special weave type for better performance. These sleeves are put underground and any additional water percolating from the upper layer gets deposited into these pipes which are drained in the end. Due to our high-quality geotextiles fabrics used, it prevents any mud particle, granules, etc., to enter the pipes and hence does not impact soil erosion. This Process Helps in keeping the soil fertile without excess water content in it. They are made as per specific requirements considering the soil, tensile of the fabric and many other factors. These tailor made products provide ready to use solutions to our customers. We offer Nonwoven Geotextile specially designed for Landscaping Applications. These Fabrics offer better drainage Function leading to higher water passage and also obstructs weed growth from the subsoil level. We can offer this fabric based on customers requirement and ahve successfully supplied for numerous projects including the coveted Mumbai international Airport Project. Width - 1 mtr to 6 mtr. Colour - White, Grey, Black are regular colour. Any other colour considering bulk requirement can be made. 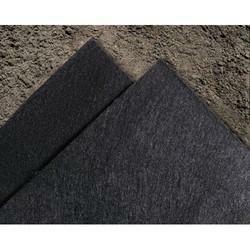 We offer a wide range of Non-Woven Geotextile and Felt Fabrics. Non-Woven Geotextile fabrics have their project, structure, or system based on various geotechnical materials such as soils, rock, earth etc. 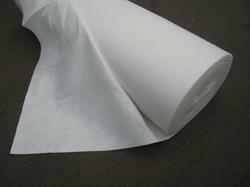 Non-Woven Geotextile fabrics are either used to restrict or allow passage of Water, as desired. Non-Woven Geotextile fabrics are also known as civil engineering fabrics, erosion control cloth, filter fabrics and support membranes. 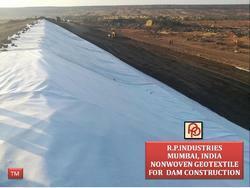 Nonwoven geotextile is used extensively in Dam Constructions throughout the world. It helps in making dams with better structural stability leading to quality construction work. Seperation : Better passage of water leading to upper soil remaining stable and good seperation between clay soil and ground soil. Reinforcement : Protection from Gravels or Boulders whihch may fall at dam sites. this Fabric will have better CBR and Tensole Strength leading to better protection to the membrane. Drainage : Easy passage of water from upper layer to ground water table. 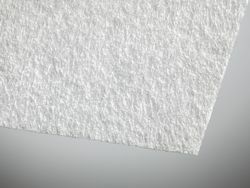 We offer a wide range of Non-Woven Geotextile and Felt Fabrics. Non-Woven Geotextile fabrics have their project, structure, or system based on various geotechnical materials such as soils, rock, earth etc. 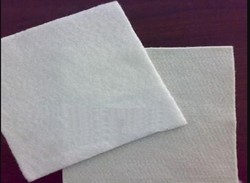 Non-Woven Geotextile fabrics are either used to restrict or allow passage of Water, as desired. Non-Woven Geotextile fabrics are also known as civil engineering fabrics, erosion control cloth, filter fabrics and support membranes. 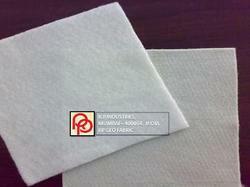 The Range of Needle punch Non-Woven Geotextile fabrics offered by us. RP Make Geotextiles are made as per Standard ASTMD . 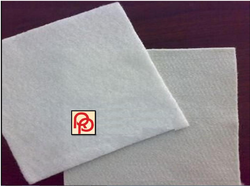 We offer our clients nonwoven geotextile fabrics that are processed using polymer based synthetic fibers. We can Offer Non-Woven Geotextile Fabrics can be customized as per required Length and Required Width.